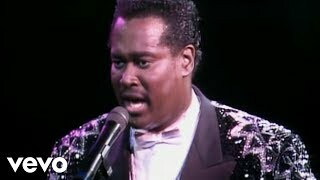 There’s a moment toward the end of the dance track “You Really Started Something” where R&B legend Luther Vandross performs his trademark vocal runs. As he begins, he demonstrate the full range of his voice, transitioning from a low rumble to a transcendent high note. In between he softly laughs, clearly enjoying showing off his talent. Indeed, Vandross established himself as a consummate singer and interpreter during his all-too-short life, and his sheer joy of music and vocalization always shined through in his recordings. Some of these lesser-known tracks, culled from movie soundtracks and studio albums, have been compiled into a new collection, Hidden Gems. By the time the album ends with the aforementioned song, the listener understands why Vandross was such a unique talent and to this day is imitated, but never equaled. Read more at Blinded By Sound. Luther Vandross ‘Hidden Gems’ In Stores Now! Today is the day! Luther Vandross’ HIDDEN GEMS is available everywhere now! This collection of 15 seldom-heard deep album tracks and movie soundtrack songs includes liner notes written by Luther’s life-long collaborator Fonzi Thornton. HIDDEN GEMS spans the full timeline of Luther’s major label recording career, from the 1970s to the new millennium. Listen To The ‘Hidden Gems’ Album Now! Fonzi Thornton has paid tribute to his late friend and collaborator, Luther Vandross, by helping to choose some special tracks for Luther’s Hidden Gems album, available everywhere April 17th. Friends and collaborators since their teenage years, Thornton helped produce the forthcoming album, which contains a treasure trove of cuts. When you were both teenagers, you and Luther Vandross became friends. Can you talk a bit about those days and how you and he honed your talents over time? I lived in the Johnson projects in East Harlem, New York and his sister Ann lived across the street from me. [Luther and I] were actually introduced by a girl in church who went to school with him. I knew him from the time we were both 14 years old. Luther was a visionary, even when we were young. When I first met him, he had a vocal group called The Shades of Jade, a very funny name. It was a group he was developing. They would sing at amateur night at The Apollo just trying to get discovered. Luther was very advanced. He was always that same singer, that same interpreter. We [eventually] sang [together] in Shades of Jade, myself and two other singers.